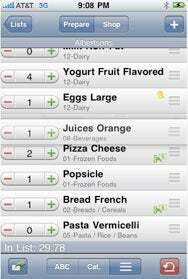 Since its arrival on the App Store back in 2008, Grocery Gadget has won raves for people who use the mobile app to manage their shopping lists. But developer Flixoft plans to introduce new features shortly that should keep the $5 app at the top of most users’ lists. The current version—Grocery Gadget 2.1.3—already lets you order your lists to match the organization at the stores where you do the shopping. You’re also able to sync your list to a Website, which lets multiple users in the same household manage shopping lists. The next major update figures to take that list-sharing ability even further by adding push notifications. With Grocery Gadget 3.0, my wife will be able to send me a push notification reminding me to pick up bread at the store. And just to make sure I get the message, she has the option of making sure that notification is accompanied by a buzz so that I can hear the notification over the supermarket’s canned-in Muzak. Multiple-platform support is on the way. Flixoft is about to release versions of Grocery Gadget for BlackBerry and Android, so multi-phone households will be able to sync lists shortly. To that end, more Flixoft apps are on the way that will complement Grocery Gadget’s capabilities and create a suite of applications. Coupon Gadget, currently in beta, will help users manage their coupons—which are on hand, which are about to expire, and which are need. Recipe Gadget is a recipe manager, while Barcode Gadget will let users look up nutritional information and other data about products.